F. Colotta, P. Ghezzi, and A. Mantovani, Interleukin-1. C.J. Sanderson, S. Karlen, S. Cornelis, G. Plaetinck, J. Tavernier, and R. Devos, Interleukin-5. A.E. Namen and A.R. Mire-Sluis, Interleukin-7. J.-C. Renauld and J. Van Snick, Interleukin-9. R. de Waal Malefyt, Interleukin-10. P.F. Schendel and K.J. Turner, Interleukin-11. R. Chizzonite, U. Gubler, J. Magram, and A.S. Stern, Interleukin-12. D.J. Matthews and R.E. Callard, Interleukin-13. M. Foote, H. Hasibeder, R. Campbell, T.M. Dexter, and G. Morstyn, Granulocyte Colony-Stimulating Factor (G-CSF). R.G. Schaub, J.P. Sypek, J.C. Keith, Jr., D.H. Munn, M.L Sherman, A.J. Dorner, and M.B. Garnick, Macrophage Colony Stimulating Factor. S. Devereux and D.C. Lynch, Granulocyte-Macrophage Colony-Stimulating Factor. D.J. Hilton and N.M. Gough, Leukaemia Inhibitory Factor. S.D. Lyman, A. Mire-Sluis, and B. Gliniak, Steel Factor/Stem Cell Factor. R. Beyaert and W. Fiers, Tumour Necrosis Factor a/b. E. de Maeyer and J. de Maeyer-Guignard, Interferon g.
M. Shoyab, N. Malik, and P.M. Wallace, Oncostatin M.
F.W. Ruscetti, M.C. Birchenall-Roberts, J.M. McPherson, and R.H. Wiltrout, Transforming Growth Factor b.
P.J. Nelson, J.M. 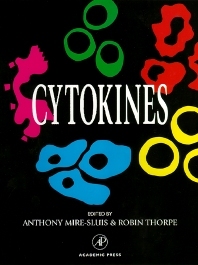 Pattison, and A.M. Krensky, The Chemokine RANTES. R.J. Nibbs, G.J. Graham, and I.B. Pragnall, Macrophage Inflammatory Protein 1-Alpha. P. Proost, A. Wuyts, G. Opdenakker, and J. Van Damme, The Human C-C Chemokines Monocyte Chemotactic Protein-1, -2, and -3 (MCP-1, MCP-2, MCP-3). S. Haskill and S. Becker, GRO/MGSA. Summary Tables. Subject Index. Researchers in pharmacology, immunology, cell biology and medicine. Biotechnology companies. NIBSC, Blanche Lane, South Mimms, Herts, U.K.